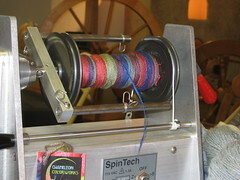 This is two ounces of silk, spun pretty fine. I'm gonna estimate it at 30-45 wpi (wraps per inch). I have no idea how much yardage - maybe 2000 yards? This is gonna be my next project. 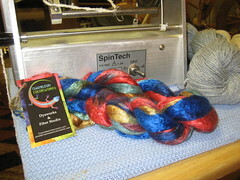 I'm going to have one ply of this silk from Chameleon Colorworks, and one ply, maybe two, of the grey romney. oooo, this is gonna be fun. 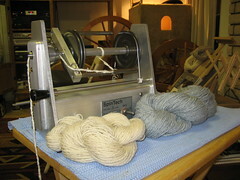 I'm just gonna spin, see what I get, and then figure out what I'm going to knit with it.